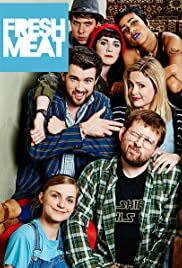 How many episodes of Fresh Meat have you seen? I am a big fan of Peep Show, The Inbetweeners and other British comedies as well as shows like Trailer Park Boys and Arrested Development. I also tend to like college/high school drama/comedy, so it comes as no surprise I really did enjoy this program. Being American, I admit that it took me a while to adjust to the accents and I still have to rewind some parts to see if I can figure out what they said, many of the jokes go over my head because they are referring to culture across the pond. There is also a certain annoyance factor with regard to several of the more 'hipster' characters and the self-centered younger generation in general. I am probably a bit older than the typical demographic who like this show, therefore I try not to be too judgmental. The thing I like most about the show are the diversity of characters. The six main characters are all completely different. It is through their sometimes awkward interactions the humor abounds. Then there are the consequences of the choices made by young freshmen in college. Add to the formula, the way the show mixes drama with the comedy to keep it from ever becoming too sappy and goofy. It's the perfect blend of both, with some very cool music replacing your father's laugh track in traditional sitcoms. The humor can sometimes be dark, subtle, or downright lurking in the bushes outside like an intruder in the night. Sometimes it hits you in the face like a Three Stooges skit and other times it challenges the mind with sophisticated rapid-fire precision. I really enjoyed the first three seasons and I am looking forward to a fourth and final season which is currently in production. I am happy they gave them one more go. All I can say is, I am so glad I came to the party late and could binge watch all the episodes in a few days... I would have hated to wait week after week for a scant 6 episodes a year.